Decided to eat some highly rated ramen from Menya Sandaime on a ridiculously stormy day. Despite being an udon/soba guy myself, I’d never pass on a steamy hot bowl of goodness that is ramen. I was pretty excited to give it a shot given all the rave reviews and get rid of the gloomy mood typically associated with storms. 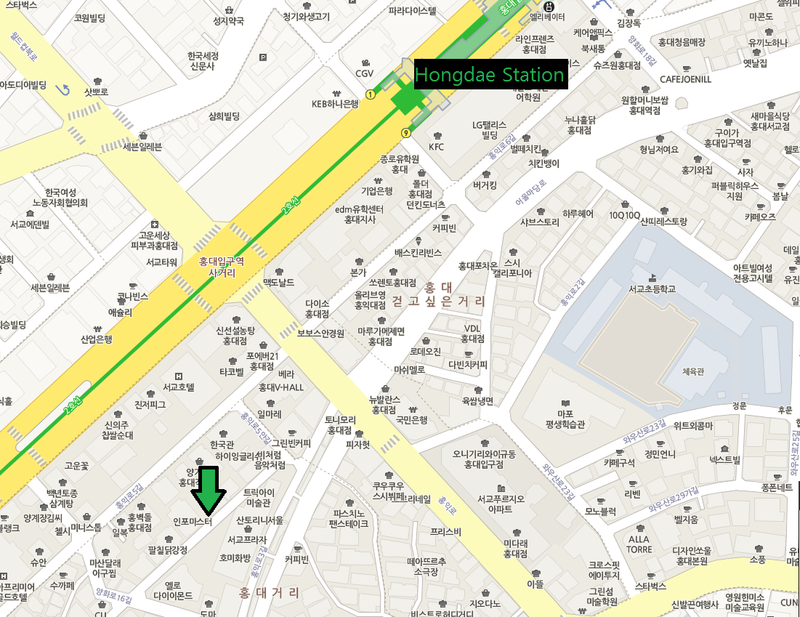 I visited the Hongdae location, but they have locations in Itaewon, Jongro and Gangnam as well. Will this ramen live up to the hype? 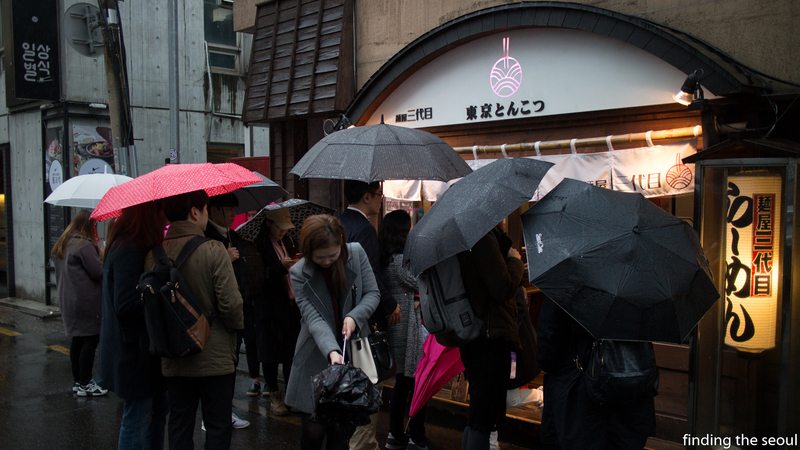 Dedicated believers of the ramen religion. Atmosphere The restaurant was tiny and quite cramped, but it had that authentic Japanese ramen shop atmosphere. 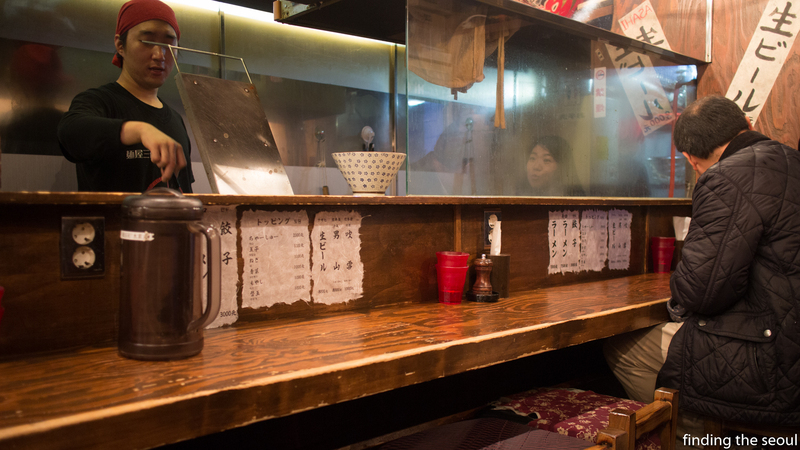 Lots of old wooden facades, a bar top, and workers who spoke Japanese to each other to carry out orders. There was table seating as well that accommodated parties of two. 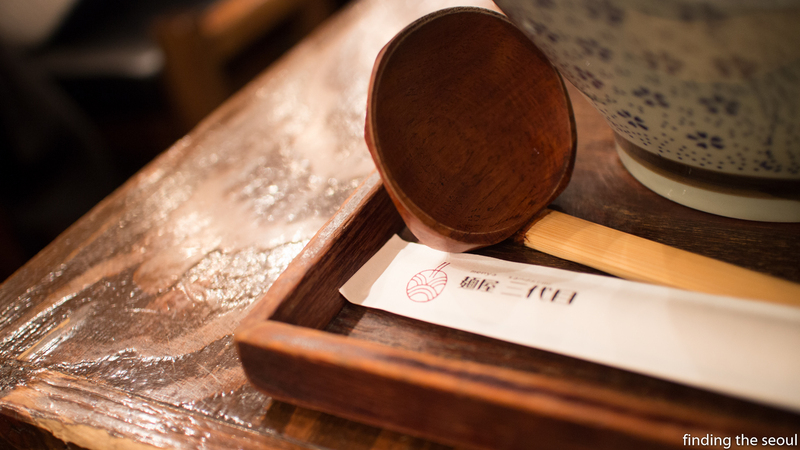 The restaurant had a meticulous attention to detail with the presentation of their food, from the uniquely tall funnel bowls that the ramen was served in to the beautiful wooden soup spoons. This would carry onto most of the aspects of their food as I would later find out. Menu The menu doesn’t do a terribly good job of telling you what’s in everything. 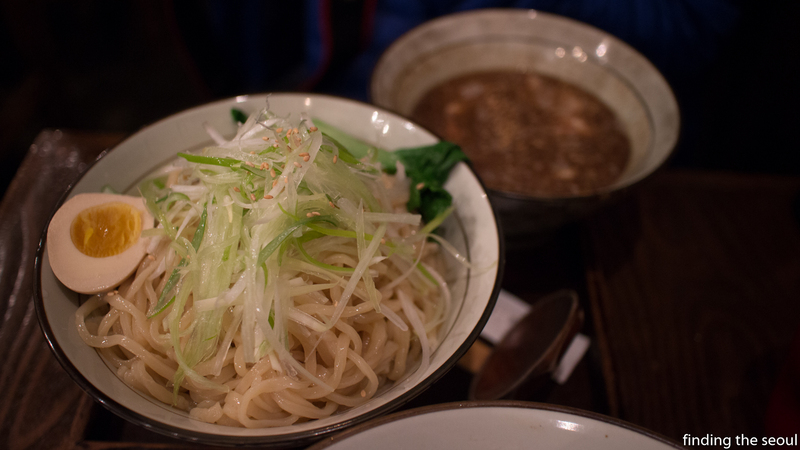 The first section is composed of ramen choices and the kaedama is a double order of noodles. At 1000 won, it’s very tempting to get, but trust me the portions are gigantic even for American standards and you may regret that choice(more on that later). 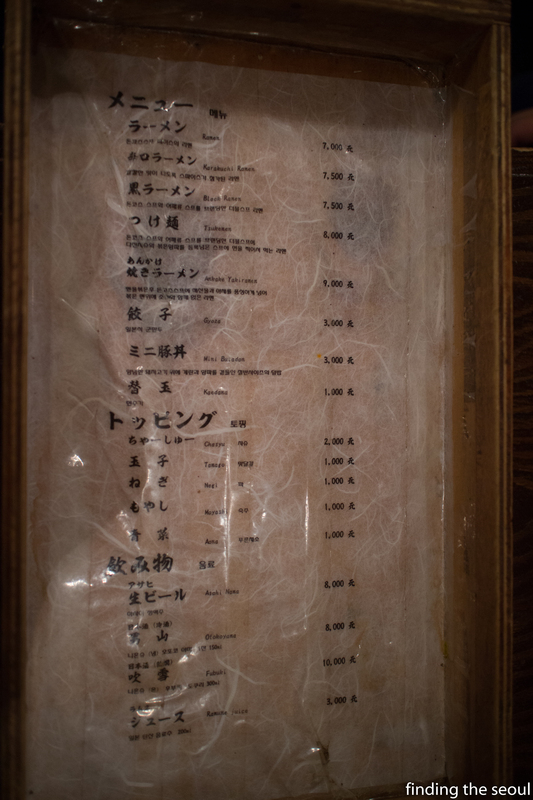 The second section is for toppings to add to your ramen, and the third is a selection of alcohol. I ordered the kuro ramen plus the kaedama. 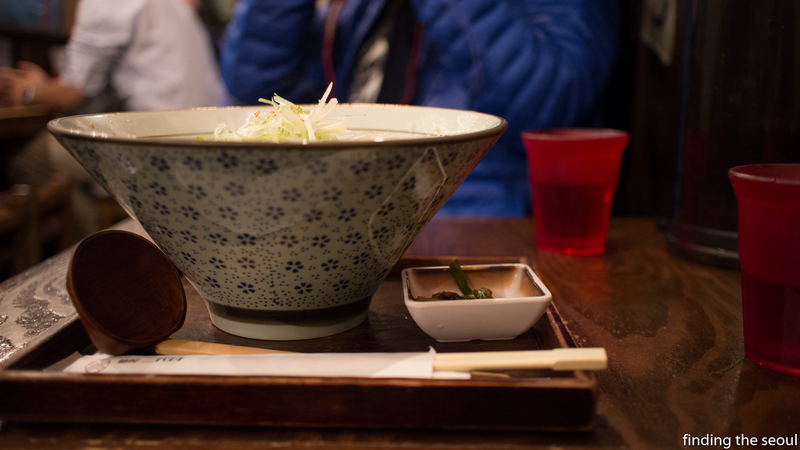 It appeared to be a tonkotsu-based broth with an overzealous use of pepper to give it a really bold and salty flavor. Some may even consider it to be spicy, akin to the kick derived from black pepper. 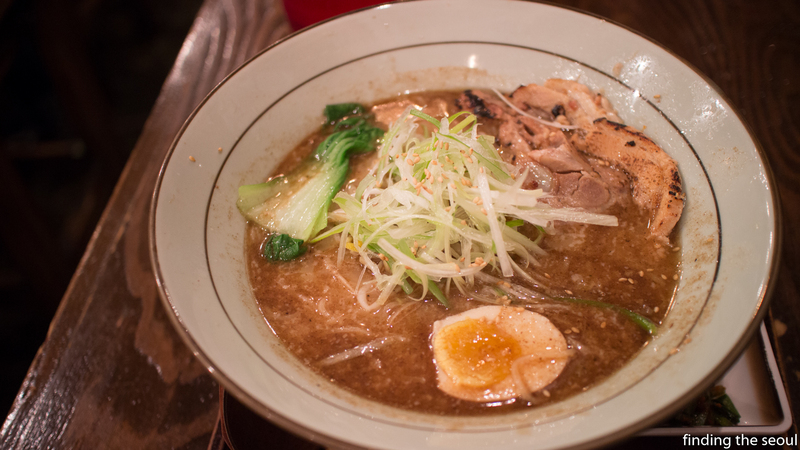 There were many unique elements going on with this ramen, but some weren’t as positive as others. 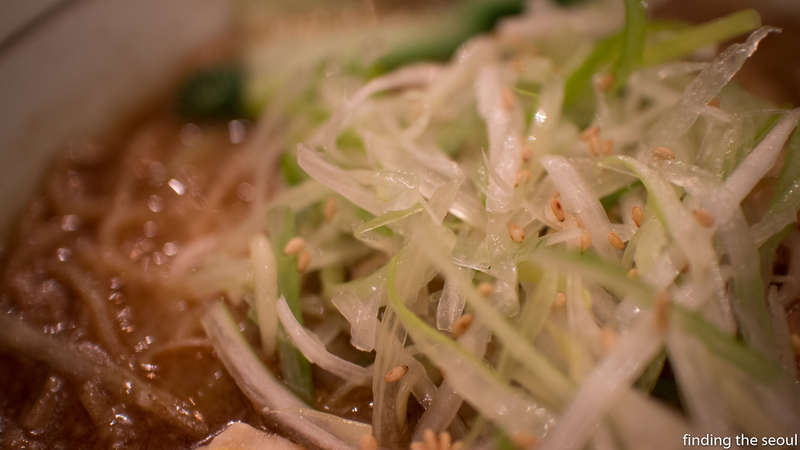 Just by looking at the long-cut green onions, you could tell this ramen had a very meticulous creator working on every detail concerning this creation. Their boiled egg was perfection. The egg was pulled out right before becoming fully cooked, giving a creamy and almost cheesy sensation. I believe there was some marinating involved with the egg as well as the whites were browned. 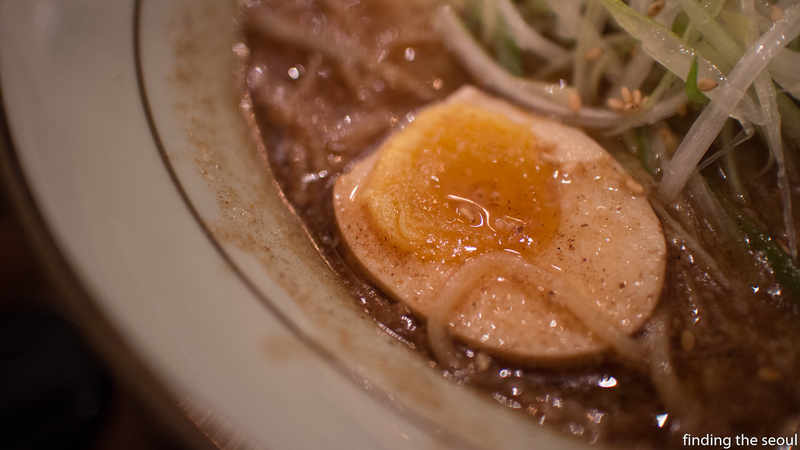 Combined with the broth, it made for a boiled egg beyond any I’ve ever had. The chashu (bbq pork) was undoubtedly the highlight of the dish for me. Being extremely fatty, most of the meat just wanted to melt in my mouth. However, you could tell the fat was rendered somewhat, which didn’t make it feel overly greasy at all. 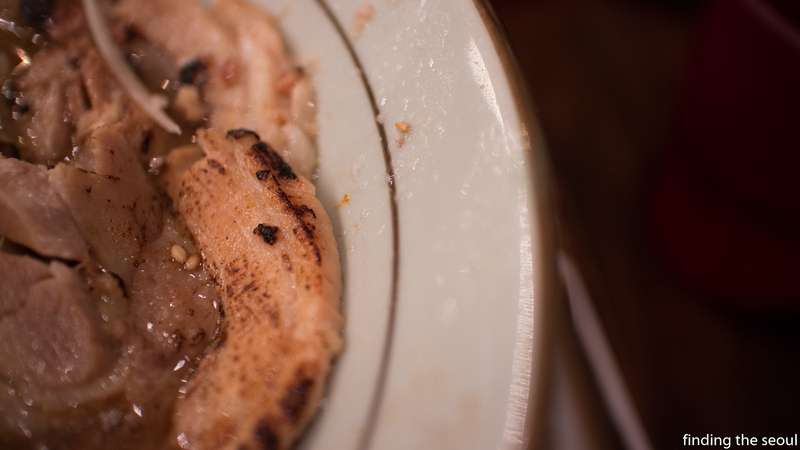 It had a very subtle savory flavor, relying on the natural taste of the meat as opposed to a marinade. On top of this, the light charring added a dry, crispy texture contributing to a very complete experience. It was so perfect that I even preferred this over the revered kakuni. The noodles were surprisingly off for me. I felt they were somewhat overcooked as they were lacking the chewy resiliency that I usually look forward to when I eat soup noodles. It was barely there, so for me I was a bit disappointed. While the noodles absorbed the soup well and tasted pretty good for me, there just wasn’t enough chewiness for me. I hear that these noodles were made in-house, which could’ve contributed to this as fresh noodles are extremely easy to overcook. Back to the broth, it was definitely flavorful. Extremely thick, and much darker than the typical tonkotsu. 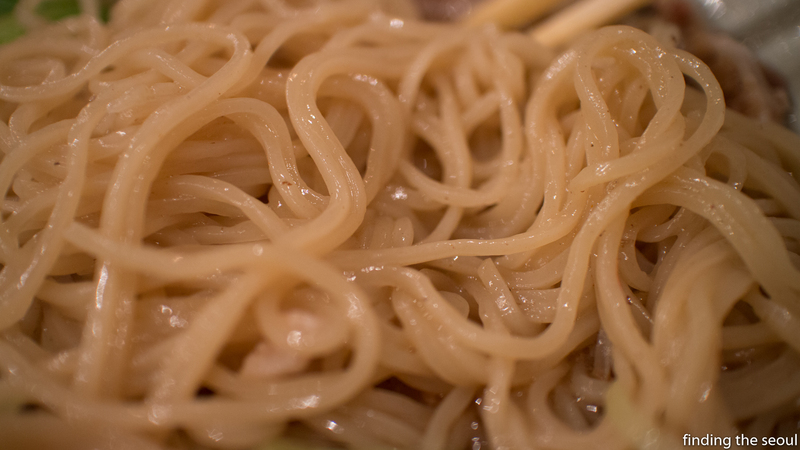 However, progressing deeper with the ramen, the saltiness began to take its toll and made it harder to eat enjoyably. The order of additional noodles was much more than I expected, making finishing the noodles a much bigger chore than I had imagined. As I continued to eat, I became less and less satisfied with it. I highly suggest you don’t get the kaedama as it somewhat ruined the experience for me. Tsukemen (Deconstructed Ramen) – 8,000 won My friend ordered the tsukemen, a deconstructed version of the black ramen. He also commented that the noodles were overcooked slightly and the soup was a bit too salty as well. He also made the unfortunate error of ordering the kaedama and felt pretty overwhelmed at the end as well. Gyoza (Fried Japanese Dumplings) – 3,000 won The gyoza was prepared quite uniquely. 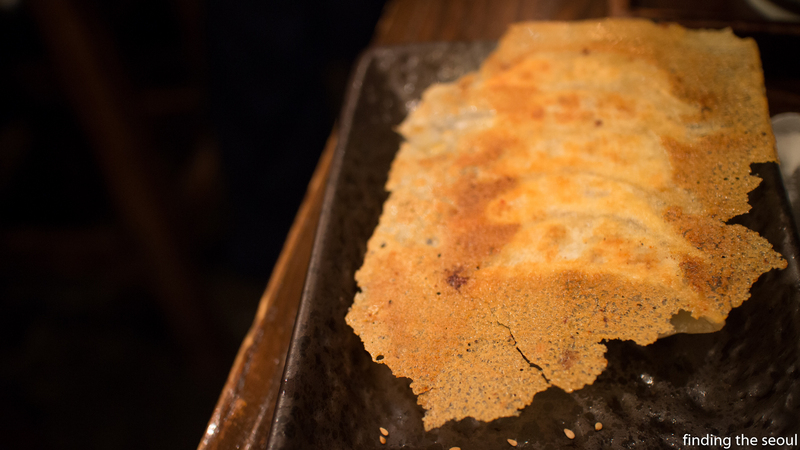 They added some batter-filled water to finish steaming it off, which made it looks very much like a fried cracker of sorts. You had to cut the gyoza out, making it feel like you were more of an archaeologist of some sort. It was sort of fun and exciting. The crispy base was fun to munch on as well. 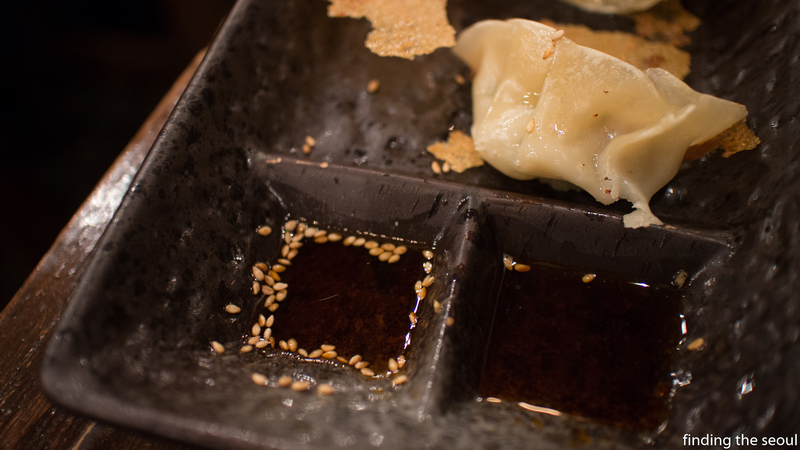 The gyoza was served with vinegar and a chili oil sauce. 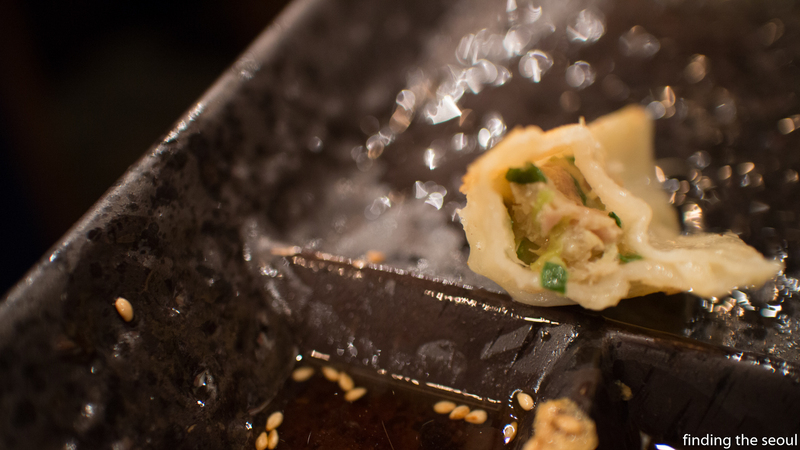 The dumpling skin was dehydrated and chewy, giving an interesting contrast to the base. The filling was very simple, but powerful. A little bit moist, with a good meat ratio. Because there wasn’t a whole lot of filling, you had to treasure each morsel. It had that Japanese minimalist approach going on. While there were many amazing elements to this ramen, the almost intolerable saltiness was the most crucial issue for me. Everything had an amazing attention to detail, but I wish they had went a bit simpler with the seasoning of the broth. I think if I come here next time, I’ll have to get the plain tonkotsu and see how that compares. I was definitely pleased with this place, but it was a bit disappointing solely due to the salt control.